Goalkeeper Mathew Ryan says Brighton & Hove Albion have to work hard to end their recent slump. The Seagulls have picked up just two points from their last six Premier League games and are now just three points above the relegation zone. Ryan feels Albion have not had that little bit of luck in recent weeks. They did not get the rub of the green with a couple of decisions in the 3-1 loss to Burnley on Saturday and that came on the back of a 0-0 draw with Watford the previous week when Hornets keeper Ben Foster starred. Albion's stopper said: "Ben Foster was man of the match last week and Tom Heaton made a couple of fantastic saves (for Burnley). "It's just that feeling of having seen a black cat or something like that. We're just not getting that little bit of luck which is required sometimes at the minute. "It's frustrating but we've got to do everything in our power to change that. I'm a big believer that the harder you work, the more luck you get. "We've got to get back to the training paddock, knuckle down and do what we need to do in order to get out of this little rut." Ryan has also been frustrated with the lack of clean sheets Albion have managed this season. 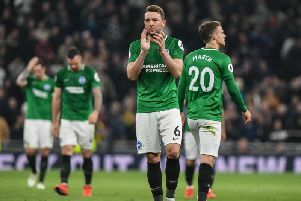 After keeping ten last season, Brighton have managed just five this campaign and Ryan said: "As long as I've been here and long before that I know the defensive structure has been the focal point of the team, which gives us our identity. "It has been the pattern all season. We've only kept five clean sheets all year. That's half the tally we had last year. "There are still games to go but we are giving them away too easily at the moment. It was a bit of bad luck as well (on Saturday), Dunky slipping, me slipping on the third one and we turned the ball over far too cheaply on the second one. All of a sudden we are three on two at the back.